One of the newest, and most popular, treatments offered in the Azul Medical Spa is microchanneling. 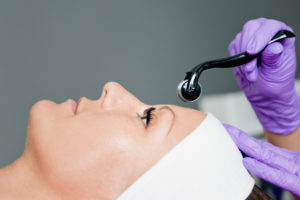 Microchanneling is essentially a more advanced version of the classic treatment, microneedling. In microchanneling, a special applicator is used to create up to 1,000 channels per square inch, at a depth of 1.5mm. This precise depth penetrates through the top layer of your skin, inflicting an intentional minor injury to the layer below. Once your body’s natural healing processes kick into action, new collagen will start to be produced under the skin, resulting in a reduction of wrinkles and a clearer, smoother complexion. The procedure only takes about 30 minutes, so you can even do it during lunchtime. After your microchanneling treatment, your skin will be super receptive to any skincare products applied as the product can travel through the channels deeper into your skin and supercharging the results. After treatment, your aesthetician will suggest a few Azul SkinHealth products to apply, and here are some of the best. During microchanneling, our estheticians use a specially formulated Intensive Renewal Serum with 5 GF and HA (that is short for 5 Growth Factors and Hyaluronic Acid!) in a roller ball applicator that is applied directly to your skin during the procedure. This serum infuses your skin with super nutritive ingredients including growth factors, cytokines and hyaluronic acid (the best ingredient known to hydrate tissue!). Think of this serum as the food your skin needs to regenerate, plump and renew. These super-nutrients work together to regenerate tissue, increase collagen production and reinforce capillaries and circulation as well as hydrate the skin. Our go-to serum after microchanneling is a thicker version (with more HA) of the Intensive Renewal Serum for home use, containing the same growth factors, cytokines, and hyaluronic acid. When used regularly after microchanneling, this powerful combination of high-tech growth factors and HA helps your skin retain moisture and provide long-term regeneration benefits. Our Growth Factor Renewal Cream is probably one of the most popular products in the Azul SkinHealth line. It’s our most powerful anti-aging moisturizer, that also helps to accelerate tissue repair, a very useful property after a microchanneling or microneedling procedure! The secret ingredient of our Renewal Cream is growth factors. These peptides help to speed up the growth of epidermal cells, as well as reduce wrinkles. Other ingredients help to reactivate the collagen production under your skin, essentially doubling down on collagen after your microchanneling treatment. One of the only issues with microchanneling is that, by damaging the top layer of your skin, it can make it far more receptive to sun damage. And anytime of year in Florida, that sun is darn near impossible to hide from. So, what can we do? We can apply Azul SkinHealth’s Satin Eclipse Sun Protection after a microchanneling treatment, to protect your skin from the harmful UV rays! This is a two-in-one product: a fantastic sunblock and a luxurious moisturizer. Equipped with antioxidant vitamins C and E, the slow-release formulation of the sunscreen means that, after you apply it, your skin will be hydrated and repaired throughout the day. As far as sun protection goes, it can’t be beaten with broad spectrum SPF 34 protection. It not only blocks UVA and UVB rays, it also blocks infrared light as well. You can even wear it under your makeup! And finally, Satin Eclipse includes micro-silicone particles that provide a satin finish on your skin. Protect your microchanneling results with the best sun protection you can buy! If you have acneic skin, this incredibly effective formulation can help unclog your pores and minimize your acne. Its anti-inflammatory, anti-microbial, and anti-bacterial properties help fight acne, especially when it penetrates deep into your skin (like after a microchanneling treatment). If you have sensitive skin, you don’t have to worry, our Acne Defense Serum has been carefully formulated to be non-irritating and non-drying. Not only would we suggest using this immediately after treatment, many of our patients take a bottle home with them for daily use. If you want a serum that will both promote collagen production AND help treat your acne, then the Regenerating Serum with EGF might be your product of choice. This is a skin-tightening serum that contains an intensive duo of anti-aging peptides, including growth factors. These will speed healing after your microchanneling treatment, as well as boost collagen production even more. The peptides will also help heal any acne, while the cocos nucifera in the serum will start to recondition the skin and improve the lipid barrier strength. Altogether, this is a potent skincare product that will maximize your results after your treatment, and maintain them for long after with daily use. The Growth Factor Renewal Cream, Satin Eclipse Sun Protection, Acne Defense Serum and Regenerating Serum with EGF are all available both in-clinic and here at the Azul SkinHealth website shop. Now that you know more about these post-microchanneling options, you will be all set to tell your aesthetician exactly what you want! If you’re also looking for other ways to really improve your skincare results, Azul offers a number of rejuvenating surgical and non-surgical treatments. If you’d like to book an appointment for a free consultation, please give us a call at (239) 747-1148, or visit our website at www.azulbeauty.com for more information about our services.